"US, World War I draft registrations records 1917–1918", digital image, FamilySearch, Utah, Salt Lake City. Draft Division# 3 Roll# 1983913. "Serial# 1787 Order# A1899, Arthur Russell Sackett, 340 Post St Salt Lake City Utah, Age: 43, b. 21 Aug 1875, white, native born, electrician at Utah Copper Co, nearest relative: Sarah Sackett, 340 Post St Salt Lake City Utah, Registrant: Tall Ht, Slender Build, eyes blue, hair brown, no disabilities, Reg: 12 Sep 1918 at Salt Lake City Utah." "Utah, Death and Military Death Certificates, 1904–1961", digital image, Ancestry.com, "Arthur Russell Sackett, d. at Warm Springs, Salt Lake City, 30 Nov 1924, res. 340 Post St, res. 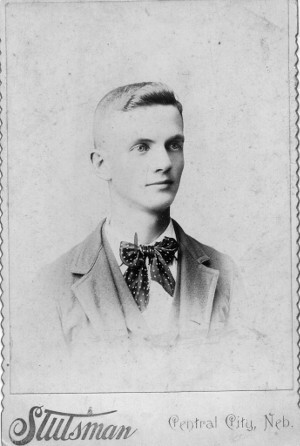 SLC 25 yrs, b. Warrensburg, Illinois, 21 Aug 1875, age 49-3-9, pipe fitter, widowed, wife Jane Crowther Sackett, father Orange E Sackett b. Ohio, mother Emma Chesley b. New Hampshire, informant Arthur Sackett, 340 Post Street, death caused by accidental drowning Warm Springs, bur. City Cemetery, 5 Dec 1924." "Utah Cemetery Inventory", database, Ancestry.com, "Arthur Russell Sackett, b. 1875, d. Salt Lake City, 5 Dec 1924, Salt Lake City Cemetery, source: Sexton Records, D-11-16-1-E-C2RD." "Utah Marriages, 1887–1966", database, FamilySearch, "15 Aug 1898, at Tooele, Utah, A R Sackett, 24, and Miss Janie Crowther, 27." "Utah, Death and Military Death Certificates, 1904–1961", digital image, Ancestry.com, "Sarah Jane Sackett, d. at LDS Hospital, Salt Lake City, 2 Nov 1922, res. 340 Post, res. in SLC 57-11-3, b. Salt Lake City, 29 Nov 1864, age 57-11-3, housewife, married, spouse Arthur R Sackett, father William J Crowther b. South Wales, mother Ann Harman b. South Wales, informant Arthur R Sackett, cause chronic nephritis, chronic myocarditis, bur. City Cem, 5 Nov 1922." Moser, George A, boarder, 28, single, b. UT, father b. PA, mother b. UT, car repairer, railroad.